When the new year started in January, I had made a list of resolutions. Some of them like losing 10 kgs in a year etc. never work out, but one of them was hosting a Daring Kitchen Challenge. And I did! My favourite modaks for the month of September. The details and precision which go into preparing a challenge is tremendous. And then once I submitted the draft of the challenge, it went through a rigorous testing schedule by the volunteers at the Daring Kitchen. A few modifications later, it was up for the world. Every year during Ganpati, we make these modaks at home. Essentially, it has two parts. One is the covering (ukad in Marathi) and the other is the filling (saran in Marathi). Different households have slight variations in making it, but basically the covering is made of rice flour and the filling is made of a mixture of fresh coconut and jaggery. For the Daring Cooks challenge, I made three different varieties of modak. Two of them steamed, and one fried version. I am hoping cooks all around the world will try this little traditional western-Indian delicacy and like it. “The legend of Ganesha , the elephant headed God goes this way – Goddess Parvati, the consort of Lord Shiva, created a boy out of the sandalwood paste she used for her bath and breathed life in to him. Then she asked him to guard her door while she went for a bath. Meanwhile, Lord Shiva who had gone out hunting came back. Ganesha did not allow him to enter, as he did not know who Shiva was. Enraged, Shiva severed the head of the child. Parvati was very angry and disheartened by this. Lord Shiva promised to find a head for him and bring the boy back to life. His devotees tried to find the head of a dead man, but only found the head of a dead elephant. Shiva fixed it on the body of the boy and brought him back to life, and from that day was called Ganesha. 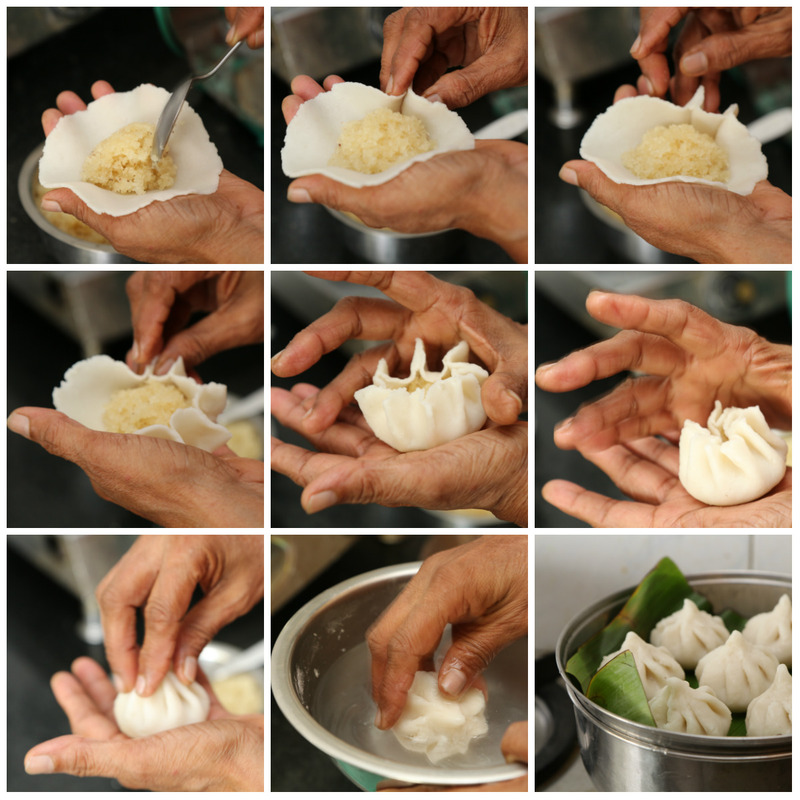 Firstly, we make the filling of the modak. Take the fresh shredded coconut, jaggery and water in a thick bottomed vessel. 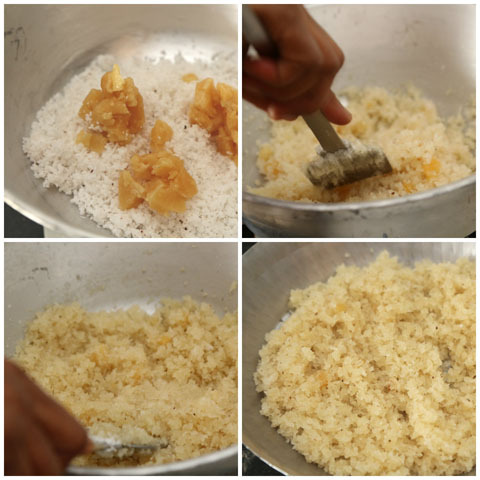 Put it on medium heat and stir continuously till the jaggery begins to dissolve. Alternately, you can melt the jaggery in microwave for in bursts of 30 seconds and then add it to the fresh coconut, it will come together faster. Roast it for a couple of minutes, till the mixture becomes slightly dry. Take the mixture off heat and spread it on a plate and let it cool down completely while you make the covering. To make the covering, sift the rice flour and 1 tablespoon all purpose flour with the smallest sieve twice so that it is very smooth. The all purpose flour is used to make the rice flour more sticky. In a thick bottomed vessel, take the water and add butter and salt to it. Let it come to a boil. Once water starts to boil, add the flour mixture all at once. Take it off heat and mix it together with a spoon. Then put the mixture back on heat and sprinkle 2 tablespoons water. Cover and let it steam for 1 minute over low heat. Take it off heat and let it stay in a corner covered for 10 minutes, It will get softened. Once it has considerably cooled down, pulse it in a food processor for a minute, take it out and knead with hands to bring it together to form a smooth dough. Prepare the steamer. Fill a large vessel with water covering the bottom of the steamer. Place steamer on top and keep it ready. We place the modaks on a banana leaf for steaming, but you can use a plain tea towel instead. Make 12 equal balls of the dough. With a little water, flatten each ball into a thin disk with your hands or in a non-electric roti maker, about 4 inches in diameter. Then take it into the palm of your hand. Stuff it with some mixture leaving ½ inch on all sides. Start pinching the corners into petals with the use of your index finger and thumb and middle finger on each side. Make several such petals all around the edge of the disk. Then start getting all the petals together by pressing it closer with your fingers. Seal the top and keep it covered with a damp towel till a few are ready to be steamed. 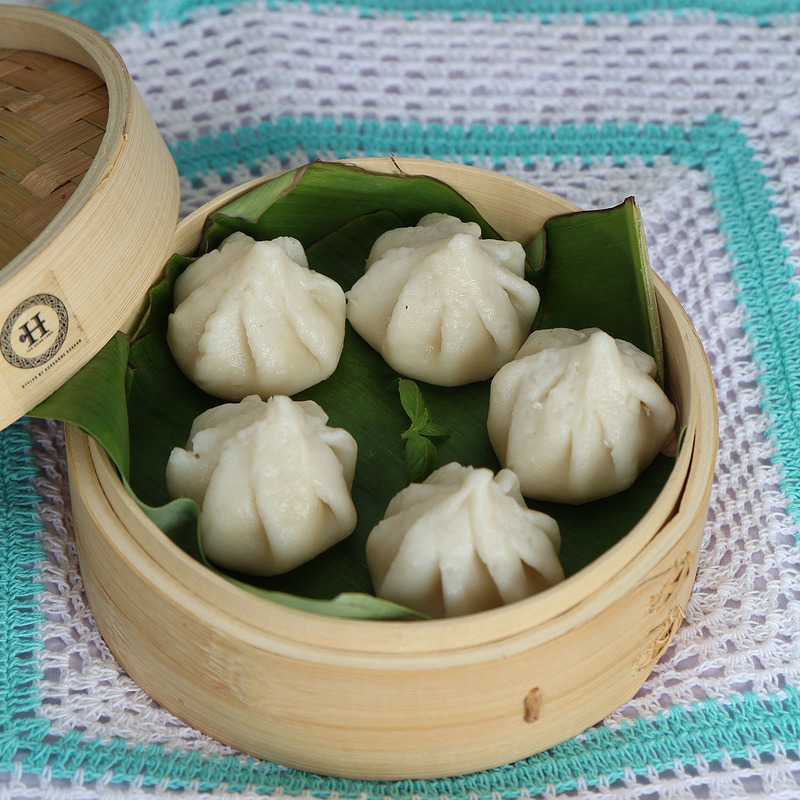 Immerse each modak in water before placing it in the steamer filled with boiling water. Steam for 15-20 minutes. Serve hot with a dollop of ghee (clarified butter). Note : I have tried to simplify the recipe as much as possible for the non-Maharashtrian and the non-Indian cooks. 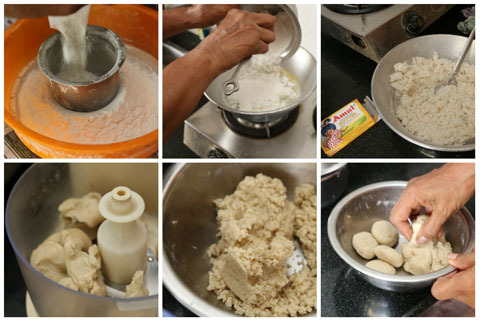 The shaping of the modaks can get quite complicated, my mom’s grandma used to make a tower of 7 modaks on top of each other, starting from one single modak.